Deadline. In general, the copy deadline for each issue is the Friday 10 days in advance of the Monday cover date. The deadline for the Bulletin that covers May 17-30 is Friday, May 7. A complete publication schedule is available at deadlines or by calling (609) 258-3601. Princeton NJ -- Earl Miner, an emeritus professor at Princeton and a leading scholar of English and Japanese literature, died April 17 after a long illness. He was 77. 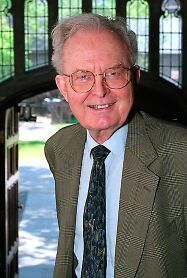 Miner joined the Princeton faculty in 1972 and retired as the Townsend Martin, Class of 1917, Professor of English and Comparative Literature in 2000. A specialist in early modern English literature, classical Japanese literature and comparative poetics, Miner was presented with the University's Behrman Award in 1993 for distinguished achievement in the humanities. He also received the Order of the Rising Sun from the Japanese government in 1994 in recognition of his commitment to Japanese literature. "Few scholars of his generation or later ones, for that matter had anything like his intellectual and linguistic range," said Sandra Bermann, chair of the Department of Comparative Literature. "Studying literature East and West, and exploring the theoretical bases for such intercultural comparison, were abiding intellectual passions. As one of the early members of Princeton's Department of Comparative Liter- ature, Earl quickly ex-tended its reach well beyond the European literatures." "It always amazed me that, though Earl shared his time and his loyalties with three Princeton departments English, East Asian studies and comparative literature he participated in each as if he were a full-time member," Bermann added. Robert Fagles, the Arthur Marks '19 Professor of Comparative Literature Emeritus, said he will remember his longtime colleague for "his intellectual reach, his sense of scruple and his desire to conserve the best of the human spirit." Miner was known as a dedicated and loyal teacher who considered his students an extended family, Bermann noted. Thomas Hare, a professor of comparative literature who specializes in early and medieval Japanese literature, said a seminar on Japanese poetry he took with Miner as a Princeton senior in 1974 "set the course for my own career in many ways." "He wore his knowledge lightly, with grace and modesty, but made the deep excitement he felt about poetry palpable to generations of students," Hare said. Miner wrote numerous books that reflected his range of research specialties. He recently completed a new book, "Paradise Lost, 1668-1968: Three Centuries of Commentary," which will be published this summer. He was president of the Milton Society of America, the American Society for 18th Century Studies and the International Comparative Literature Association. Miner earned a bachelor's degree in Japanese studies and master's and doctoral degrees in English from the University of Minnesota. Before coming to Princeton, he was a member of the English faculty at Williams College from 1953 to 1955 and at the University of California-Los Angeles from 1955 to 1972. Survivors include his wife of 53 years, Jinny; his son, Erik; and his daughter, Lisa. In lieu of flowers, memorial contributions may be made to the Earl Miner Memorial Fund, Department of Comparative Literature, Princeton University, 133 East Pyne, Princeton, NJ 08544. At his request, no memorial service will be held.